Most of you have probably heard of The Daily Show, but what some of you probably don't know is that Jon Stewart was not the original host. 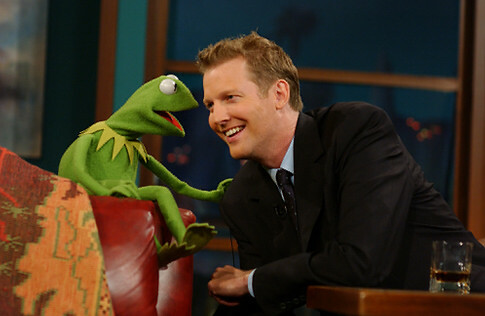 That honor belongs to Craig Kilborn. My senior year in high school I was addicted to Sportscenter. Watching it as I went to bed with Dan Patrick and Keith Olbermann and waking up to Craig Kilborn and Stewart Scott. Those four anchors made ESPN what it is today. Craig eventually left ESPN for cable TV, specifically Comedy Central. He would go onto host The Daily Show for 3 years before getting a bigger job as the Late, Late Show host following Letterman. The Daily Show was great during Kilborn's time. It wasn't political like it is now. It was like SNL's Weekend Update. The segments were great and the interviews were memorable. I still remember Keith Olbermann coming on the show doing an interview (where he bad-mouthed ESPN) and then getting suspended for a week because of it. The best part of his interviews was 5 questions. It was just that, 5 trivia type questions for the celebrities. After he left, I actually watched some of Jon Stewart's version. I remember his first week when he did his interviews he started with 5 questions and everyday would take one question away, until they were all gone after one week. I rarely watched it after that first week. I'm not one to stay up late to watch Leno or Letterman, so staying up after that to watch Kilborn wasn't an option...until TIVO. The Late, Late Show was pretty similar to The Daily Show except that the news segments were gone. The headlines and 5 questions were still there, but the missing news segments kind of ruined it. The show was an hour which was nice, but sometimes it dragged on. Besides by then I was recording Jimmie Kimmel's show which was better (sorry Craig). It had to be like a month after I got TIVO that Kilborn announced he was leaving tv again. I was pissed to say the least. Kilborn has a sharp sense of humor and is very sarcastic. He plays this arrogant person and plays it up well. So I was shocked and happy to hear about his new show, The Kilborn File. It has a 6 week test period to see if it will go national and continue on. It is more like his Late, Late Show than The Daily Show. In fact, the set looks almost identical to his LLS set. But it is only 30 minutes, so it has that Daily Show feel to it. I have enjoyed watching Kilborn again and hope that this thing continues on. The timeslot might not be the best (6:30 PM here in CA), but my fingers are crossed. Like I said, this show needs to make it. Watch some clips HERE. Labels: The Kilborn File, The Sun Always Shines on T.V.